Repairs may be polished in 10 to 15 minutes. Repairs will not gum up, tear-out, or smear into the surrounding surface when polished. Use with a variety of sands and pigments to achieve different colors and textures. Microdoweling™ action gets in deep and repairs the concrete from the inside out. Architectural color, patterns and surfaces can be maintained. Twin cartridge pin-point application for small cracks and joints. Bulk bucket mix application for spalls and large area treatment. Cures in a wide temperature range from –20F to 100F. Worldwide network of trained distributors. Available in gray or natural white. Fill divots, pop outs, and bolt holes. Concrete Mender™ Off-wite will take on the color of the added quartz sad an shown here. Repairing concrete with Roadware Concrete Mender™ Off-white. 1. Meet with the floor owner to determine the ultimate floor repair goal and desired outcome. In some situations, it may be better to repair cracks and defects as they are. In other situations, it may be better to open them up with a diamond blade. While no repair material can make cracks and defects disappear, with Concrete Mender you can make these areas much less noticeable. 2. Prepare floor cracks, joints, spalls, and pop-outs in accordance to standard application instructions. Deep repairs in heavy traffic areas should be repaired up to 1/2 inch (7mm) from the surface using standard Concrete Mender™ repair techniques. 3. Sand selection: By altering the sand used with Concrete Mender™ Off-white, different color results can be achieved. Some experimentation may be required to get the desired result. Start with a dry concrete sand such as Quickcrete brand All Purpose Sand. Sift out any rock larger than the area you are repairing. Other types of sands such as silica sand, colored quartz, and flint may be used. Choose the best combination to match your floor. Any type of sand you use should be hard, free of dirt and organic material, and completely dry. 4. Color: Concrete Mender Off-white will cure to a neutral off-white (70300) color or gray (80300) Small amounts of powdered concrete colors such as Solomon Colors may be mixed in with the sand as needed. Experimentation to determine the best sand and color combination will be required to get the desired effect. 5. Mixing: Combine mixed Concrete Mender™ Off-white from a dual cartridge, with the sand in a pail to form an approximate one part liquid to one part sand ratio. Mix quickly by hand with a paint stick. Work in batches of one pint (500ml) or less until you are comfortable with the material. The sand to liquid ratio can be varied depending on the type of sand used and the gradation. Finer sands will require more liquid. The resulting polymer mortar should have very little slump and a wet appearance. 6. Quickly apply the material directly to the prepared repair areas. Use a margin trowel to finish the repairs. Leave the repairs slightly higher than grade. The excess material will be honed off later. 7. Allow the repairs to fully cure for 15 – 30 minutes depending on the temperature and the size of the repair before honing or polishing. 8. Dying and staining: Concrete Mender™ when combined with sand will accept most dyes and stains. 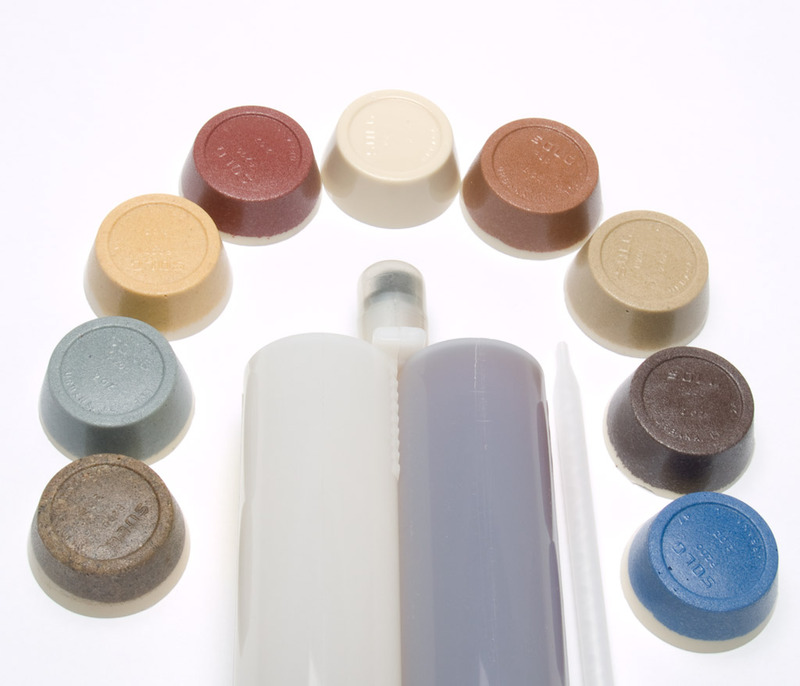 Be sure to open the surface of the repair by mechanical means before applying dyes or stains. This can be done by honing or polishing. Always experiment in an inconspicuous area first to get desirable finish. 9. Repairing previously honed or polished floors: Select an appropriate sand combination and make the repairs as stated above. Use care not to stain the surrounding concrete with repair materials. Finish as normal. Will MatchCrete™ Concrete Mender change color in direct sunlight over time? Concrete Mender Off-white™ will yellow under direct sunlight. This effect will be minimized when using powdered colors added to the sand. The darker the color added the less yellowing will be noticeable. For non-yellowing outdoor repairs, see MatchCrete™ Clear. What kind of color can I add? For most colors, the color of the sand will determine the color of the repair. Use Colorquartz from 3M or similar material to get the desired color. You may also color the repair by adding a small amount of powdered colors such a Solomon brand concrete color to the sand prior to making the repair. As the Concrete Mender™ Off-white penetrates the sand, the color will disperse throughout the repair. Can I add concrete dust to MatchCrete™? You can add a limited amount of concrete dust from your project to MatchCrete™ when mixed in bulk. It is best to experiment and test before use. Can I add too much color? Yes, use just enough color needed for the job. Adding too much dye, or too much powdered color to the sand can hurt the performance of the repair.